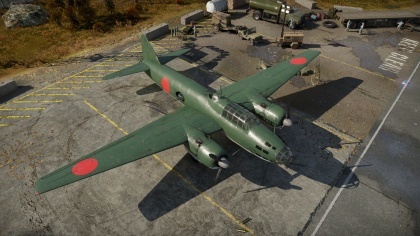 The G4M1 is a Rank II Japanese bomber with a battle rating of 3.0 (AB/RB/SB). It has been in the game since the start of the Open Beta Test prior to Update 1.29. The Americans nicknamed it "Betty", whilst the Japanese called it "Hamaki" ("cigar" or "leaf roll"). 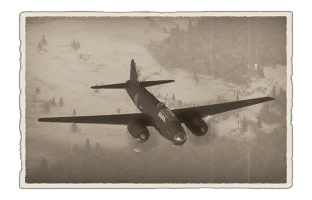 This vehicle is more dangerous the longer it stays in game- this is because, whilst it's armament of 4 x 250 kg bombs is a small one for its BR and rank, it can destroy most targets that it will encounter with these bombs, so more bombing runs make it more devastating to the enemy ticket counter. This plane can be used as a base bomber, but this normally results in death, as the enemy climbs to meet you and it only takes a few shots to destroy you. The G4M1's most effective play is destroying ground targets like Light Pillboxes, tanks and gun emplacements; the 250 kg bombs work on ships well too. It is not suggested to climb in the G4M1, as you need the protection of air superiority to be secure higher up, but the Allied aircraft you face will engage your fighters before they reach you. Accuracy is everything with the G4M1. You need to be on target with your rear gunner, otherwise an enemy sitting behind you will make quick work of you. The 20 mm cannon is devastating if you hit- this can be hard for novice bomber pilots, but expert bomber pilots will know where to aim. The other guns on the G4M1 have little effect, but try to use them if the enemy is closing in in that direction. This plane needs to be fast to avoid trouble and good at defending itself- stock, it can do both things, but not very well. It is suggested that you research Engine and flight performance as quickly as possible so you can skirt around the edge of the map, away from fighters. Alternatively, if you believe you can handle fighters, research the defensive armament lines first. Bomb load-outs are the next most important thing- fortunately, since research at this rank costs very little time, you can research defensive armament and bomb load-outs alternately; this will make the G4M1 an effective weapon. Protection is non-existent for the G4M1, so you should research survivability upgrades last, as it will not help you survive fighter attacks. No fuel tank protection, if ignited, it will burn until destroyed. Designed as a lightweight medium bomber, the G4M1 sacrificed protection in order to achieve high-speed and an operational range of 2,850 km. Unfortunately, this made the plane extremely vulnerable to Allied fighters and anti-aircraft fire who found the engines and fuel tanks particularly flammable. The plane's finest hour was the sinking of the HMS Repulse and HMS Prince Of Wales, the first two capital ships sunk in open waters by aircraft during wartime. The plane also played a role in the final hours of Admiral Isoroku Yamamoto. Two G4M1 bombers of the Kōkūtai 705, escorted by 6 A6M2 fighters Kōkūtai 204, were to carry him from Rabaul to Balalae Airfield near Bougainville Island. Admiral Yamamoto's purpose in traveling to Balalae Airfield was to inspect Japanese aircraft participating in Operation I-Go, and to boost morale following the intense battles at Guadalcanal. However, U.S. naval intelligence decrypted orders sent to Japanese commanders regarding the itinerary, escorting forces, and which units were be toured. In Operation Vengeance, 18 P-38G Lightnings were sent to intercept Yamamoto, which ended in both G4M1 bombers shot down. The bomber with Yamamoto crashed in the jungle, killing him, and the other, holding his staff, crashed at the sea. This page was last edited on 21 December 2018, at 21:26.